David Bradley was painting a picture with words. The owner and chairman of Atlantic Media had gathered about 400 staffers in a small Kennedy Center theater near the company’s Watergate offices. It was the fall of 2006, and many were new hires. A year earlier, when Bradley merged the Atlantic magazine’s Boston operations with those of the National Journal and Government Executive, just 3 of 55 employees elected to make the move to Washington, DC. Nearly 150 years after its founding, the Atlantic’s reputation for intelligent, engaging journalism on topics of national interest was still going strong—but it was losing millions of dollars a year. Something had to change. Bradley, a slim, silver-haired man in his early 50s, spoke clearly but softly—a viral infection had damaged his vocal cords years before, reducing his ability to speak loudly or at length. He asked everyone to envision a rural landscape painting with a river running through it. “On one side is an arid, compromised crop that won’t come to harvest. On the other is a rich jungle of exotic plants with names like Twitter, Huffington Post, and things no one has even heard of yet.” The river, Bradley pointed out, was really very narrow. “Standing on the left bank, embittered because of what’s happening on the other side—that doesn’t make sense. My job is to get every one of us across the river.” Embrace the potential of new technologies—but don’t abandon print, either. Thoughtful, expressive, and urgent all at once, the message and its delivery were signature Bradley. The Atlantic was already online, of course, but that was about all visitors to the site would find—a direct transfer of the print publication to digital. 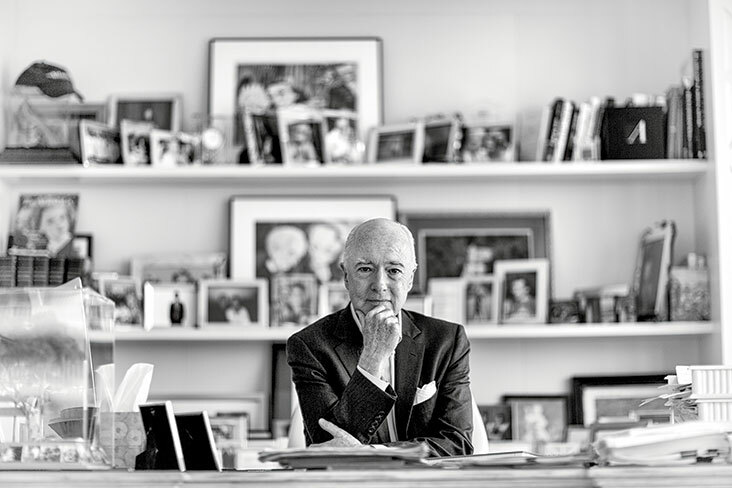 Bradley, who bought the magazine from Mort Zuckerman in 1999 for $10 million, knew that the web represented an opportunity to build and expand a well-established brand. Founded in 1857 by a group of Bostonians with triple-decker names (James Russell Lowell and Ralph Waldo Emerson among them), the Atlantic had the foresight to publish the early works of Mark Twain, Henry James, and Ernest Hemingway, to name just a few, and was well known for fostering a productive national debate around the pressing issues of the time—the modest goal being nothing less than advancing the sum of human knowledge. An expansion of the Atlantic’s online presence would need to keep that history, and that original mission, in focus. “David recognized early on that the web was absolutely transforming the way the media business in general functioned,” says James Bennet, the Atlantic’s editor in chief and copresident. “It seems like ancient history now, at least in Internet terms, but he embraced blogging, which was a radical idea in 2006 because people thought it would destroy our brand.” In other words, the magazine—a carefully thought-out and meticulously produced product—would be compromised by less polished, more off-the-cuff reflections. Resistance was internal and external. “The complaint was that we were violating people’s expectations of what the Atlantic was supposed to be,” he says. “But David insisted on discipline, a high degree of intellectual honesty, and staying true to the magazine’s fundamental values. The Atlantic has been profitable for five years now, with advertising revenue up 40 percent over last year. For now, at least, all online content is free, including full articles from the print magazine. The connection between the Atlantic’s success and Bradley’s personal involvement in its digital strategy and the recruitment of key positions is clear. But that success has been like the man himself—dramatic yet understated. The turnaround deployed two key tactics central to any challenge Bradley undertakes. The first, research, involves making phone calls and pounding the pavement with a pen, a legal pad, 3” x 5” cards, and what he describes as an “unlimited listening capacity” when questioning anyone—in this case, execs at the New York Times, the Huffington Post, Slate, Wired, and others—with special knowledge of a subject. “At HBS, Professor Lou Wells taught me what I think of as ‘granular mastery’—that all truth is found in specific detail,” says Bradley, who as a student researched and wrote an article for Harvard Business Review about the overseas expropriation of US assets. After running a regression analysis on a database of cases to determine predictors of expropriation, Bradley brought his results to Wells and began to give an overview of factors that might indicate a property was more likely to be seized. “He listened for a minute, then stopped me and said, ‘Tell me this story. What happened in this case? Was this property expropriated? You’re sure? Now tell me this story.’ We went through a series of data points to find the insights. Only when you understood the granular detail could you see the larger inductive thought. Bradley’s second tactic is finding and cultivating “extreme talent.” (See sidebar at right.) An essential hire for the Atlantic’s digital turnaround was Justin Smith, a young, up-and-coming media professional with the ability to forge new alliances between editorial content and technology. “That recruitment was hard,” he recalls. The two met for dinner in 2007 at the Carlyle, a stately bastion of formal dining in the swirling frenzy of Manhattan: “You have a three-hour shot; there’s a table by the fireplace. We talked.” Unfortunately, it came out that Smith had all but signed a contract to become publisher of BusinessWeek. Growing up in Washington, Bradley didn’t aspire to business. From the age of 13, he wanted to be a politician—specifically, the young Republican senator from the state of Maryland. “I even knew which house I wanted to live in. 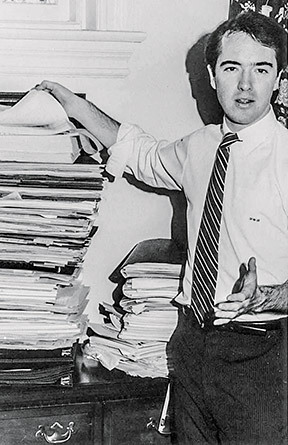 I was unbecomingly ambitious at an early age.” Bradley, who attended Sidwell Friends School and Swarthmore College, was working for Nixon’s reelection committee by the time he was 18 years old and served as a White House intern the summer of the Watergate hearings. (“It’s amazing how much whiteout you can use to get that off your résumé.”) Seeing people whose careers had been made by Nixon go to jail—John Ehrlichman, Bob Haldeman, Egil “Bud” Krogh—prompted a “revectoring thought” during Bradley’s first year at Georgetown Law School, where he enrolled after completing a Fulbright in the Philippines. Republicans whose rise to power was dependent on ties to Nixon were implicated for their actions; others, such as Melvin Laird and Nelson Rockefeller, who had risen independently, stayed above any illegal actions. “I had this naive thought that I could start a company, grow it for three years, and flip it,” says Bradley. Then, he would begin his political career from a position of financial independence. The Research Counsel of Washington was launched in 1979 in the Watergate apartment of Bradley’s mother, Terry, with office furniture consisting of a few card tables, folding chairs, and Princess telephones. “I found business so much harder than I’d anticipated,” says Bradley, who started the venture while still a law student. “So much harder than business school.” Over the years, however, the organization, which was renamed the Advisory Board Company in 1983, hit its stride by pioneering a membership model that charged clients an annual subscription rate for reports on the latest research on best practices. In 1997 the organization’s corporate membership business split off to form the Corporate Executive Board and in 1999 went public in a $160 million IPO; in 2001, the Advisory Board, which focuses primarily on the health-care industry, also went public. Today, the two businesses Bradley started employ over 6,500 people and together generate annual revenues approaching $1.5 billion. Another lesson occurred further into the company’s history. On the Friday before Christmas in 1990, van Bever and three other top-level managers, including Siska Shaw (MBA 1985), invited their boss to lunch in a private room of La Brasserie, a Capitol Hill institution for political power lunchers and Hollywood A-listers. Bradley was anticipating a celebration; instead, he was assaulted with a list of 20 complaints about his management style and requests for change. “We’d grown the company to a certain size, but we were hitting a wall. From our perspective, David was holding the reins too tightly and wasn’t sharing a concrete enough vision of where we were heading as an enterprise,” says van Bever. “I began to argue after the first couple of statements,” Bradley recalls. “Derek told me to sit and listen.” He did. The assault went on for hours. Bradley took the list with him the next day on a flight to Los Angeles and found a way to frame what had just happened in a concept recalled from The 7 Habits of Highly Effective People by Stephen Covey (MBA 1957). Skip the reason why you do something was the essential thought, and go directly to Is it true? From that perspective, Bradley found that he agreed with 18 of the 20 complaints and told his managers as much when they next met. He would delegate more, he said, but they would also have to prepare themselves to be better leaders. Ultimately, Bradley’s plan to establish an independent financial base for a political run came to fruition, even if it took quite a bit longer than the three-year timeline he had once envisioned. By the time he was ready to make his exit, he was “no longer young, no longer a Republican, and no longer living in Maryland. To that end, Bradley explains, he and editor-in-chief James Bennet will go on a “listening tour,” pen and legal pad at the ready, to jump-start the process of figuring out what that “something” might be. The destination is California, where Facebook COO Sheryl Sandberg (MBA 1995) has helped make introductions for the Silicon Valley leg. But Bradley will also travel up and down the East Coast to ask questions, listen, and think. “I treat everything as a research project because that’s what my career was,” he says simply. The next transformation, à la Bradley, will be the sum of copious notes, 3” x 5” cards, and the special sauce that comes from “extreme talent” executing the many small but significant moves necessary to lift the Atlantic above an overcrowded world of media content. Shepherding the Atlantic into its next phase is an all-consuming task, yet Bradley has made extra time in recent years for an additional and unexpected project—helping locate and negotiate for the release of American hostages in the Middle East. In September, he flew to Jordan to meet with security officials with the hope of gaining intelligence and influence useful to winning the release of American aid workers being held by ISIS in Syria. A couple of months earlier, a similar trip Bradley took to Qatar played a part in the August release of Peter Theo Curtis, an American journalist held for nearly two years by an al-Qaeda–linked group in Syria. Bradley’s involvement in the hostage issue began in 2011 as an ad hoc response to an overheard conversation between editors about Clare Morgana Gillis, a freelance reporter covering the Libyan civil war who had filed stories for the Atlantic and was now being held by Muammar Qaddafi’s forces. “None of us was doing a thing for her,” he says. That realization was all it took. Over the weekend, Bradley gathered a group of 10 staffers and approached the task as he would any research project, first delineating the concentric circles surrounding Gillis—her captors, then the captors’ bosses and family members, then the people funding the operation. Everyone was assigned part of a circle and got to work following up on leads. One of Bradley’s calls was to Jacqueline Frazier, who had been introduced to and worked for Qaddafi’s son Saadi. Within a few days, at Bradley’s request, Frazier had located Gillis and two other journalists being held with her and helped arrange their release. “Making that happen involved just under 100 outreaches,” Bradley says. Freelance journalist James Foley was one of the hostages released with Gillis; he wrote Bradley a thank-you note and then a second thank-you note once he had a fuller realization of the effort involved. “Katherine and I have taught our three boys that life is long, and this is a good example, because within a year Foley was captured in Syria,” says Bradley. Freeing Gillis and Foley had taken six weeks; when Foley’s parents asked Bradley to help again, he agreed. “But Syria is not Libya. Syria is heartbreak. Syria is horrific,” he says, alluding to Foley’s execution and that of journalist Steven Sotloff. This isn’t exactly where David Bradley, now 61, expected to find himself. He’d probably still be doing his work on behalf of American hostages, but in the original vision it would have been as a politician, not a “media mogul and philanthropist,” as he’s usually identified (he and his wife, Katherine Brittain Bradley, are cofounders of CityBridge Foundation, a nonprofit bringing best practices to DC public schools). Yet it’s easy to see how the challenges that engage him so completely could dovetail with a 13-year-old boy’s dream of being part of the inner workings of power that can shape a country and a culture. 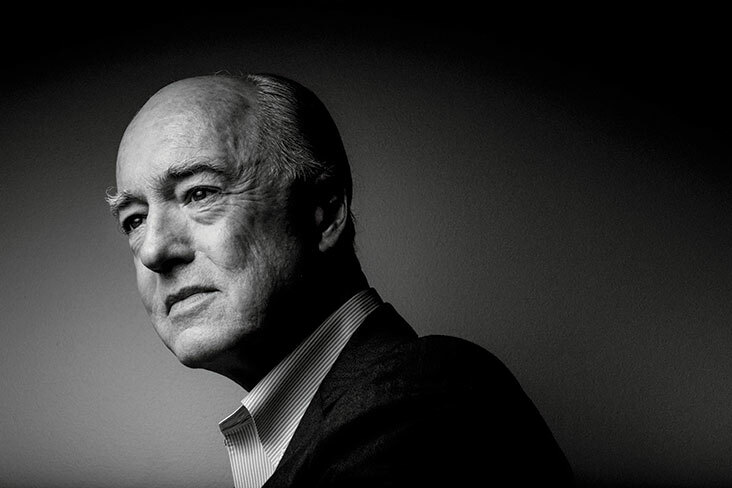 Whether turning around a publication well into its second century or working to bring home American hostages, Bradley has the front-row seat he envisioned. But he is clearly more of an actor than a spectator.